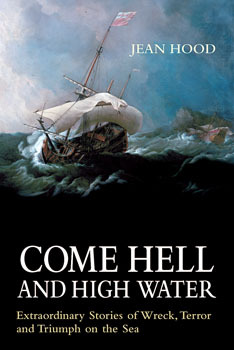 Seventeen tales of disaster, mayhem, heroism, foolishness and tragedy on the high seas are all meticulously researched and compellingly presented by Jean Hood in Come Hell and High Water. These include the doomed submarine USS Squalus, whose sinking off Portsmouth, New Hampshire in 1938 inaugurated a revolutionary submarine rescue technique, and lesser-known vessels like the Rothsay Castle, an unseaworthy ferry whose captain refused to turn back because he would have had to refund the fares. From the “floating bomb” known as The Prince in 1752 to the tragic loss of the Russian submarine Kursk in 2000, here are shipwreck dramas to absorb anyone intrigued by the history of ships and the sea. Jean Hood is the former Information Officer at Lloyd’s Registry of Shipping, where she dealt with questions from the international community on modern and historical ships. Her other books include Marked for Misfortune. She lives in England.